Global Research presents this article to highlight the pan-Lebanese character of the December protests in Beirut. The disinformation campaign attempts to portray the protests in Beirut as Shia Muslim in nature or only composed of Hezbollah supporters, when in fact a large majority of the Lebanese population have rallied against a government which serves U.S. and Israeli interests. A truck laden with yellow Hezbollah flags drives past the Christian neighbourhood of Gemayzeh early Sunday morning in downtown Beirut. There’s a picture of Hezbollah leader Hassan Nasrallah on the windscreen, but it’s not his name that the young men on board are chanting. “General, General!” yell these young Shiite boys. Image: An Anti-goverment protester wearing Michel Aoun badges. 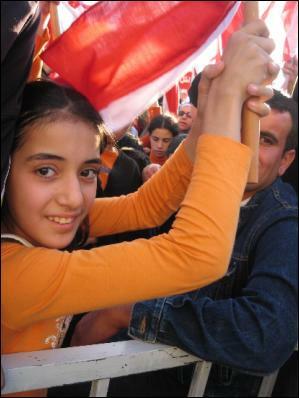 Image: A supporter of the Christian Free Patriotic Movement. Twenty-eight-year-old Sharden believes the media have been ignoring them on purpose. “We know all the media in the world, especially the Americans, are trying to make the picture that it is just the Shiites. 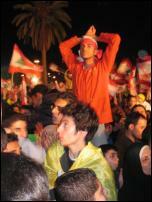 They don’t want it to look like the Lebanese are united against the government,” he tells me. It’s hard to tell exactly how many of Lebanon’s Christians belong to parties aligned with either Hezbollah or the government. Both will tell you that their numbers make up 70% of all Christians in Lebanon *and it’s a continuously argued figure that no one is this country seems to know the answer too. 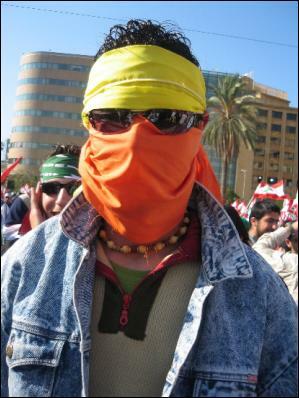 A young demonstrator wears the yellow of Hezbollah and the orange of the Free Patriotic Movement. 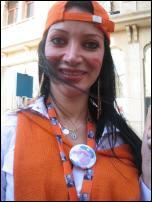 Many demonstrators wear the orange of Michel Aoun’s Free Patriotic Movement. 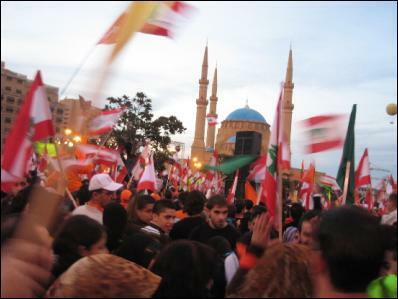 The full mix of the anti-Government opposition outside the Hariri Mosque in downtown Beirut. Whatever is behind this strange coalition between the hardline Shiite group and their Christian allies, it’s certainly producing some unique cultural mixes. As the march reaches downtown Beirut’s St Georges cathedral, Hezbollah TV vans are out the front transmitting Sunday mass live. “No we don’t usually have Sunday mass broadcast on Al-Manar,” one of the Fathers tells me inside, “but it’s still just normal mass, nothing political is said here.” As I push my way out of the packed church, I pass a funny looking kid on the steps. He has an orange T-shirt and wristband in the colour of Aoun’s Free Patriotic Movement, but a yellow Hezbollah cap and a picture of Hassan Nasrallah hanging around his neck.